Your day-by-day itinerary now includes Wat Pho, Wat Saket and Amphawa Floating Market. There's much more to do: step into the grandiose world of The Grand Palace, take a stroll through Khao San Road, and shop like a local with Chatuchak Weekend Market. To see other places to visit, where to stay, photos, and tourist information, go to the Bangkok journey planner. New York City, USA to Bangkok is an approximately 23-hour flight. You can also do a combination of bus and flight; or do a combination of flight and bus. The time zone difference moving from Eastern Standard Time (EST) to Indochina Time (ICT) is 12 hours. Traveling from New York City in February, expect Bangkok to be warmer, temps between 91°F and 75°F. Finish your sightseeing early on the 16th (Sat) to allow enough time to travel to Chiang Mai. Your list of things to see and do now includes Elephant Nature Park, Tiger Kingdom - Chiang Mai, Wat Phra That Doi Kham (Temple of the Golden Mountain), and other attractions. To find other places to visit, ratings, reviews, and more tourist information, go to the Chiang Mai trip itinerary builder . Traveling by combination of flight and bus from Bangkok to Chiang Mai takes 4 hours. Alternatively, you can drive; or take a train. Expect slightly colder evenings in Chiang Mai when traveling from Bangkok in February, with lows around 63°F. On the 19th (Tue), you'll have the morning to explore before heading off to Krabi Town. Krabi Town takes you away from the bustle of coastal beach resorts in this region. Your day-by-day itinerary now includes Chao Fah Night Market. 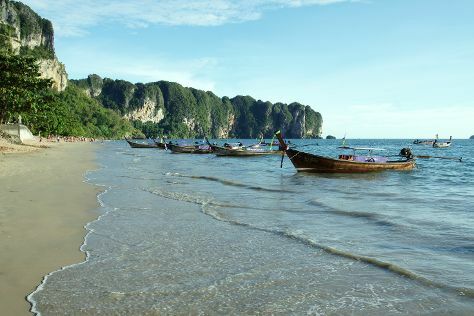 The adventure continues: enjoy the sand and surf at Ao Nang Beach. To find photos, more things to do, traveler tips, and other tourist information, you can read our Krabi Town road trip site . Traveling by combination of flight and bus from Chiang Mai to Krabi Town takes 5 hours. Alternatively, you can drive; or do a combination of train and taxi. Traveling from Chiang Mai in February, expect a bit warmer with lows of 70°F in Krabi Town. Finish your sightseeing early on the 22nd (Fri) to allow enough time to ride a ferry to Ko Phi Phi Don. Kick off your visit on the 22nd (Fri): tour the pleasant surroundings at Maya Bay. To find reviews, maps, more things to do, and tourist information, read Ko Phi Phi Don trip itinerary builder site . Traveling by ferry from Krabi Town to Ko Phi Phi Don takes 1.5 hours. In February, daytime highs in Ko Phi Phi Don are 93°F, while nighttime lows are 71°F. Finish your sightseeing early on the 24th (Sun) so you can travel to Siem Reap. Your day-by-day itinerary now includes Lemongrass Garden Beauty & Massage. There's still lots to do: delve into the distant past at Angkor Wat and don't miss a visit to Pub Street. For photos, other places to visit, traveler tips, and tourist information, use the Siem Reap online vacation planner . Traveling by combination of ferry and flight from Ko Phi Phi Don to Siem Reap takes 5.5 hours. Alternatively, you can do a combination of ferry, bus, and flight; or take a bus. 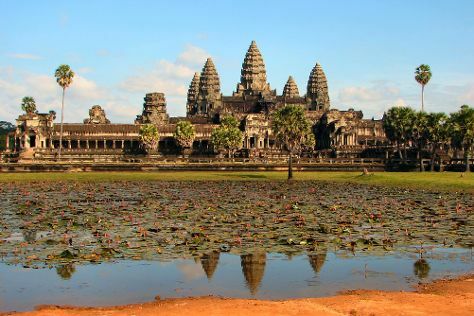 February in Siem Reap sees daily highs of 90°F and lows of 72°F at night. You'll set off for Phnom Penh on the 26th (Tue). On the confluence of two major rivers, Phnom Penh occupies a scenic location largely responsible for its nickname the "Charming City." On a trip to Phnom Penh you'll discover one of Asia's most dynamic cities, where the natives live much of their lives outdoors, on the streets, and in the bustling markets filled with scents of spicy foods. Your day-by-day itinerary now includes Bliss Spa, Silver Pagoda and Killing Fields and S21 Tour. 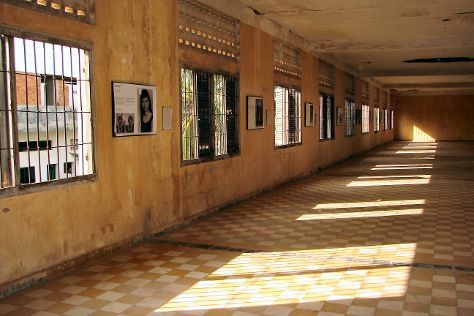 Kick off your visit on the 27th (Wed): see the top attractions with Killing Fields and S21 Tour, then take an in-depth tour of Tuol Sleng Genocide Museum, and then admire the landmark architecture of Silver Pagoda. On the next day, explore the historical opulence of Royal Palace, then examine the collection at National Museum, and then soothe aching muscles at Bliss Spa. To find where to stay, ratings, and other tourist information, read Phnom Penh trip maker tool . Fly from Siem Reap to Phnom Penh in 2 hours. Alternatively, you can drive; or take a bus. In February, daily temperatures in Phnom Penh can reach 91°F, while at night they dip to 73°F. You will leave for Kampot on the 1st (Fri). The riverside town of Kampot mixes evocative colonial architecture and a wealth of nearby natural highlights. Kick off your visit on the 1st (Fri): admire all the interesting features of La Plantation. To find traveler tips, photos, other places to visit, and more tourist information, use the Kampot online travel route planner . You can drive from Phnom Penh to Kampot in 2.5 hours. Other options are to take a bus; or take a train. On the 2nd (Sat), you're off toSihanoukville. 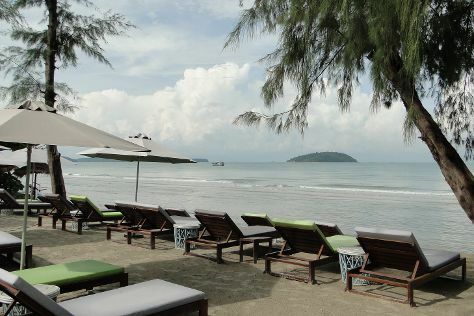 Sihanoukville, a relatively new city built around the country's first deepwater port, has been developing into a tourist destination in recent years. For maps, photos, reviews, and other tourist information, go to the Sihanoukville trip itinerary builder site . Traveling by car from Kampot to Sihanoukville takes an hour. Wrap up your sightseeing on the 3rd (Sun) to allow time to travel to Koh Rong. A slice of paradise in the Gulf of Thailand, the island of Koh Rong stands out as one of Cambodia's premier beachside escapes. 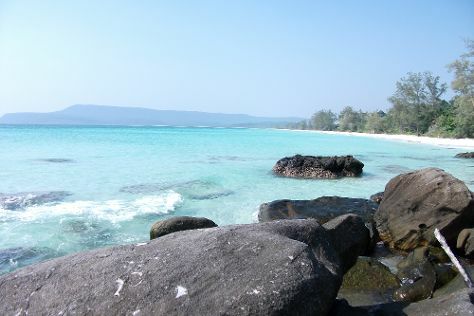 Koh Rong is known for wildlife, adventure, beaches, nightlife, and fun & games. Your plan includes some of its best attractions: kick back and relax at Long Set Beach, stroll through Jungle zoo, make a trip to Koh Rong, and have some family-friendly fun at Kohrong Blob Jump. To find ratings, other places to visit, maps, and tourist information, go to the Koh Rong online driving holiday planner . Do a combination of taxi and ferry from Sihanoukville to Koh Rong in 2 hours. On the 7th (Thu), you'll travel to Ho Chi Minh City. Formerly known in the West as Saigon and affectionately referred to as the "Pearl of the Far East," Ho Chi Minh City is a study of old and new, woven and piled together in a fast-paced urban hub. Change things up with a short trip to Hoi Khanh Pagoda in Thu Dau Mot (about 48 minutes away). There's much more to do: don't miss a visit to Cu Chi Tunnels, soothe aching muscles at some of the top local wellness centers, hunt for treasures at Ben Thanh Market, and indulge in some culinary diversions at a local gastronomic tour. For more things to do, where to stay, traveler tips, and more tourist information, use the Ho Chi Minh City online attractions planner . Explore your travel options from Koh Rong to Ho Chi Minh City with the Route module. In March, daytime highs in Ho Chi Minh City are 94°F, while nighttime lows are 76°F. Wrap up your sightseeing on the 11th (Mon) to allow time to travel to Hoi An. Indisputably one of Vietnam's most atmospheric destinations, Hoi An contains a World Heritage-listed old town boasting over 2,000 years of culture and history. Explore Hoi An's surroundings by going to Da Nang (Lady Buddha & Dragon Bridge) and Mỹ Sơn (in Duy Xuyen). The adventure continues: don't miss a visit to Hoi An Ancient Town, take your sightseeing to a higher altitude at The Marble Mountains, kick back and relax at An Bang Beach, and indulge in some culinary diversions at a local gastronomic tour. For traveler tips, photos, reviews, and other tourist information, go to the Hoi An journey planner . Fly from Ho Chi Minh City to Hoi An in 2 hours. Alternatively, you can do a combination of flight and train; or drive. When traveling from Ho Chi Minh City in March, plan for a bit cooler days and about the same nights in Hoi An: temperatures range from 82°F by day to 72°F at night. Finish your sightseeing early on the 14th (Thu) so you can drive to Phong Nha-Ke Bang National Park. Marked by underground rivers, famous caves, limestone cliffs, and tropical rainforests, Phong Nha-Ke Bang National Park wows visitors with a spectacular range of landscapes and wildlife. Explore Phong Nha-Ke Bang National Park's surroundings by going to Dong Hoi (Quang Phu Sand Dunes, Tam Toa Church, & more). There's much more to do: identify plant and animal life at The Duck Stop, Head underground at Phong Nha Caves, stroll through Phong Nha Botanic Garden, and contemplate the waterfront views at Suoi Nuoc Mooc. Ask Inspirock to suggest an itinerary and make planning a trip to Phong Nha-Ke Bang National Park fast, fun, and easy. Traveling by car from Hoi An to Phong Nha-Ke Bang National Park takes 5 hours. Alternatively, you can do a combination of flight and taxi; or do a combination of train and taxi. Finish up your sightseeing early on the 17th (Sun) so you can travel to Ubud. Your day-by-day itinerary now includes Sekumpul Waterfalls. On the 21st (Thu), spend a fun day on foot with Walking tours. There's still lots to do: look for all kinds of wild species at Sacred Monkey Forest Sanctuary, Head underground at Elephant Cave Ubud, and make a trip to Tegalalang Rice Terrace. To find maps, photos, reviews, and other tourist information, refer to the Ubud online trip maker . Explore your travel options from Phong Nha-Ke Bang National Park to Ubud with the Route module. The time zone difference moving from Indochina Time to Central Indonesia Time is 1 hour. March in Ubud sees daily highs of 88°F and lows of 77°F at night. You'll have a few hours on the 24th (Sun) to wrap things up before traveling home.